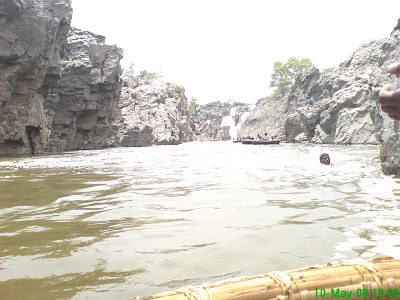 Tales Of A Nomad: Hogenakkal- The Smoking Rocks...!! All work and no play makes Niranjan a dull boy. This was quite true in case of my office team as we needed a much refreshing break. After a lot of discussions we decided that Hogenakkal falls would be our rejuvenation destination. We were five of us and left on a sunday morning at 8 in a car. The roads were smooth from Bengaluru to Dharmapuri. The road from Dharmapuri till Hogenakkal was a winding one with green pastures all around. Hogenakkal in Kannada can be loosely translated to Smoking Rocks ( Hoga meaning smoke and Kal meaning rock). 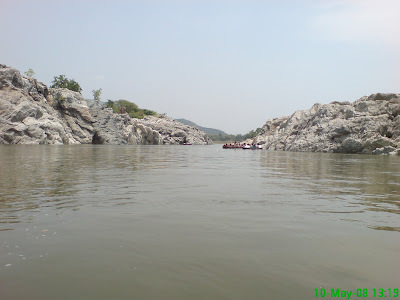 Hogenakkal is the place where the Cauvery river meanders itself through a lot rocks. As a result of water falling on the rocks, it creates a smoky ambiance and hence the name. There are numerous falls all around ranging from as small as 5 feet to more than 20 feet. 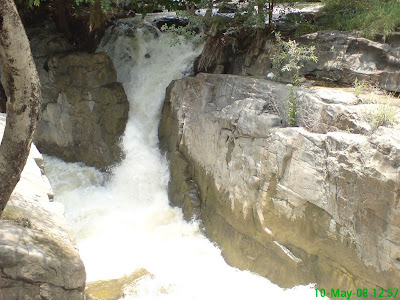 These lovely falls have been formed as a result of Cauvery river gushing down the rocky gorges. Being a weekend, it was quite crowded with kids, families, weekend trippers etc. all over the place. After a couple of photo-shoots on the slippery rocks, we took the steps down that lead to the coracles. A coracle ride on the Cauvery waters is a must for all the visitors as it takes you closer to nature and gives a feel of the surroundings and the environment. 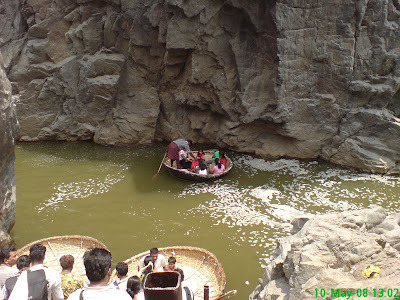 After a lot of haggling with the coracle guy regarding the rates, all of us jumped into the bamboo tub and got ready for a ride down the disputed river. Our boatman explained that one bank of the river was in Karnataka and the other in Tamil Nadu. That was a lovely piece of geographical information for all of us. He took us under a couple of waterfalls and we got drenched while still sitting in the coracle. That was an exhilarating experience. 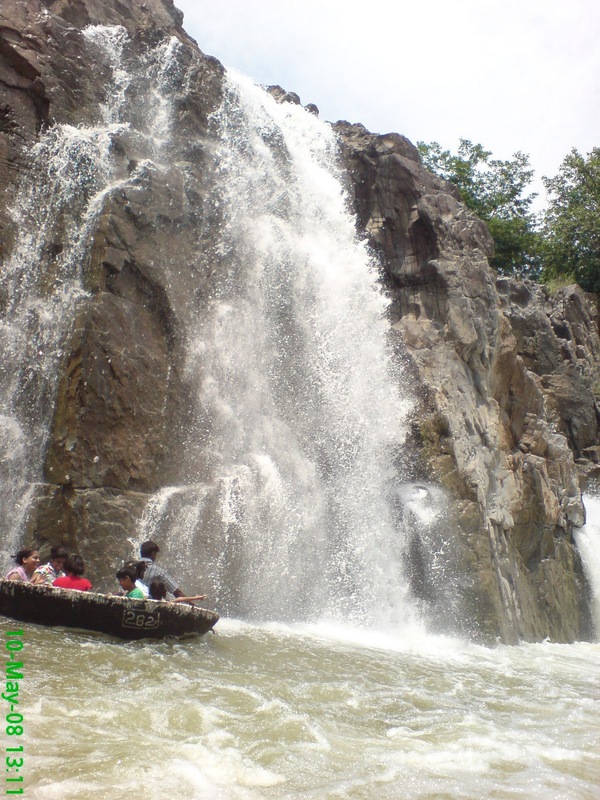 It is believed that the Cauvery water in these areas are therapeutic. Hence we found a lot of people taking their medicinal baths in the river. Another thing that enthralled us was the jumps by boys aged 10-12 years from top of a rock at a height of more than 20 feet, into the waters. They then swam towards us to collect their charges for the same which was a mere Rs.10. They entertained us with their continuous jumps and we were stunned at their brave act. Being a tourist place, even the Cauvery was not spared from commercialization as we saw a couple of coracle-shops selling everything that a normal kiosk would. 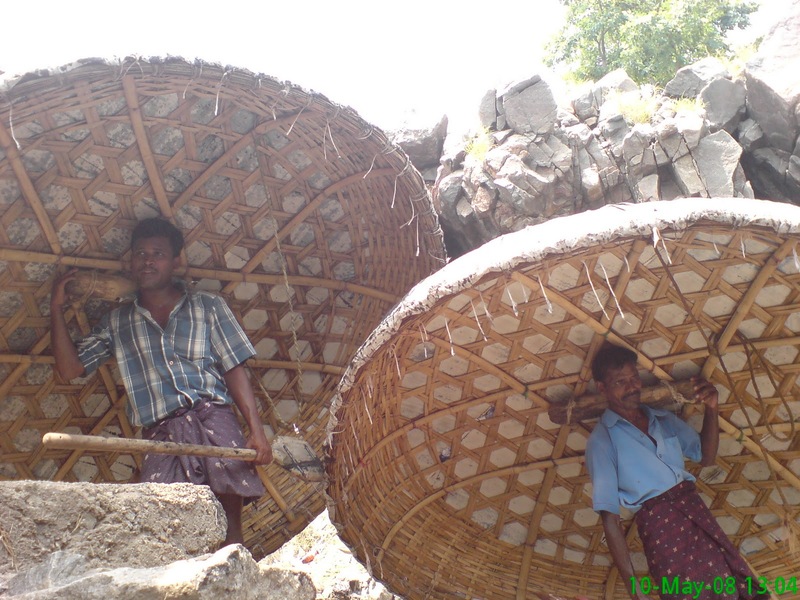 The boatman sold biscuits, wafers, water bottles, tetra-pack juices to the people passing by in other coracles. It was past noon and our boatman pulled up to one of the banks. We had a good oil massage there for about an hour. The masseurs were the locals who did it in a very professional manner. After that it was time for a dip in the free flowing Cauvery. Hungry tummies were crying out and we had a lovely meal with fried fish. The fishes were caught and instantly prepared by the ladies on the banks. Must say that it was one of the best fried fishes I had ever gorged on. With nothing much to do, we had a longer stint in the waters and played around gleefully till the current got stronger and the skies got cloudy. It started drizzling as we got into the coracle and had a rainy ride back to the starting point. Our boatman gave us a final feel of Cauvery by swirling the coracle at a good pace in the middle of the river. We in fact had to request him to stop his frenzy act. That swirling of the coracle was however the icing on the cake which cannot be explained but only experienced. 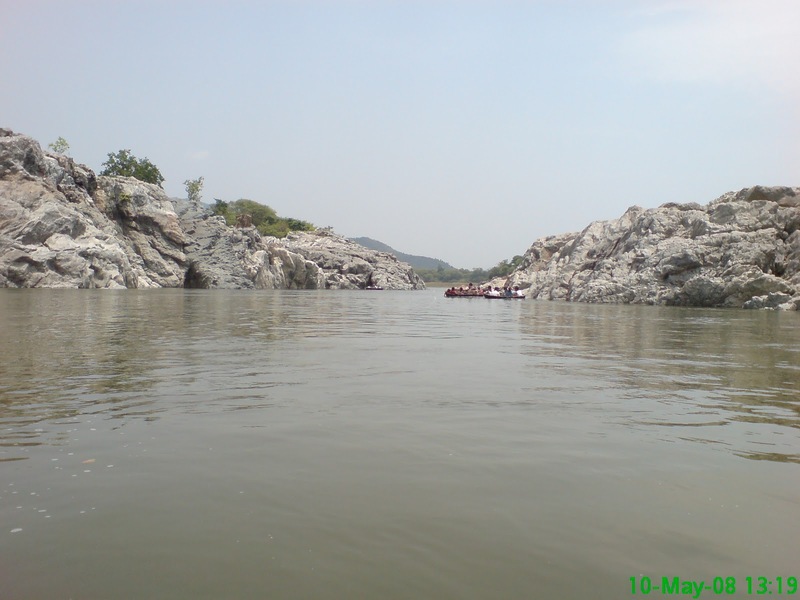 The best time to visit Hogenakkal would be after the monsoon, when the Cauvery is at its very best. Also known as the Niagra Falls of India, this is one of the natural beauties that you cannot give a miss. Signing Note: A natural rejuvenation centre which is God-made and not man-made. haha...yup, its a must visit destination. I have never visited this place. Great sights! It is a wonderful sight with numerous waterfalls. Head there soon. I thought this would be about smoking cigarettes! But this is much nicer. Haha. Glad that you liked it. Thanks Anupam. Keep dropping by. I would have died here in 2001. I had decided to climb one of the waterfalls after swimming to its bottom. While climbing on top when I was just about to reach the top, I suddenly felt like looking back. I turned back to look down and suddenly I had a feeling that I am falling down. The next moment, I was sliding down into the water. I was fortunate that my head didn't bang on the rock etc. I could use backstroke and rise up in the pool and then came to the bank. The only thing I remember is that everybody was silent and were watching me. Yeah, definitely a local spa. A treat for your eyes. Wow! Great way to spend a day!! Now that sounds like a perfect day! I have yet to set foot in a coracle but surely one day. And the piece of geography was new to me as well! Definitely a great way to spend a day. You will love coracle rides. It indeed is a captivating one.